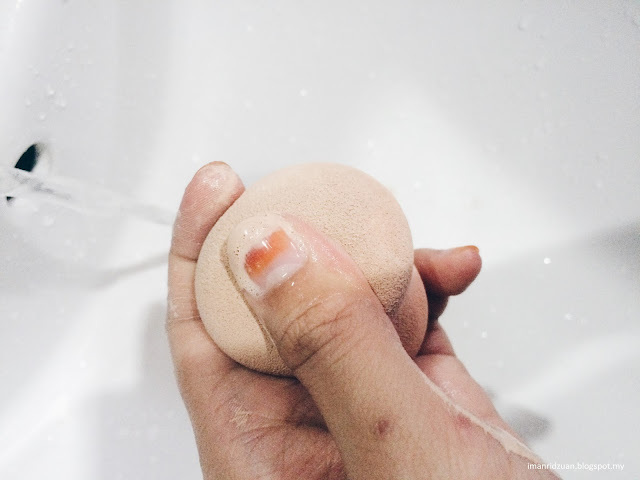 If you're like me who love to use makeup sponges to blend products instead of using brushes, gurlll (or guys) I know your struggle when it comes to keeping it clean! I love to use baby shampoo to clean my makeup brushes, but unfortunately baby shampoo does not clean makeup sponges and puffs very well. 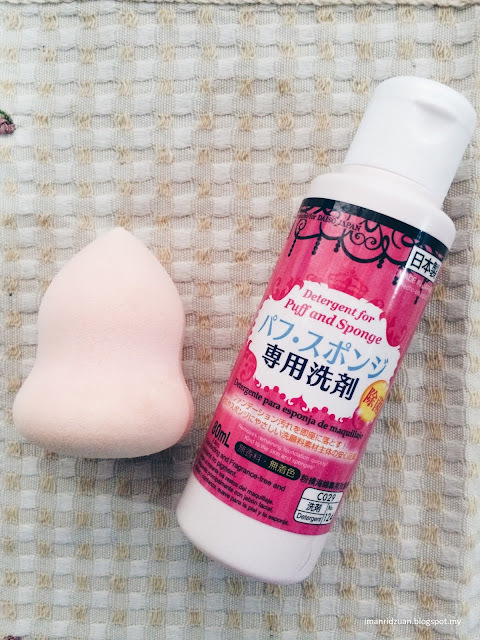 I saw this detergent for puff and sponge from Daiso and decided to give it a try. It has been a life saver ever since. Or money saver. haha. 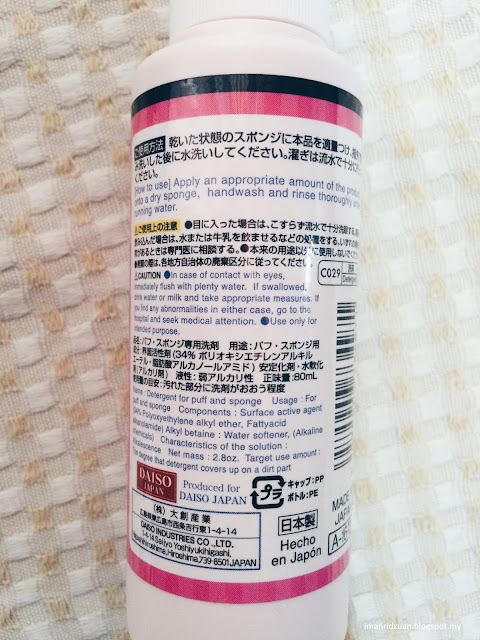 The product claims to be fragrance-free and contains no pigment, which is very true. I couldn't smell anything when I pour the detergent on my hand. It comes out as a clear runny liquid. The direction to use it is pretty straightforward. You just pour a little amount of the detergent onto your dry sponge, give it a little rub into the sponge and wash it off under running water. The detergent is not super foamy when in mixed with water, but it still gets the job done very well. I can clearly see all the foundation, bb cream, concealer and cream blushes just run down into the sink and it is super satisfying lol. I made sure to really wring out any excess detergent by giving it a good few squeezes under running water before drying it. And tadah! My marshmallow sponge is back looking as good as new! 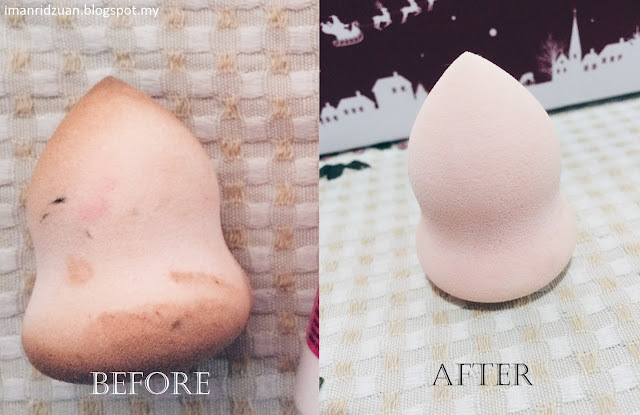 I am sorry if you're grossed out by how dirty my makeup sponge is. Don't worry it is super clean now haha! So next time before you decide to replace your makeup sponges and puffs with a new one, try this detergent instead. It actually works pretty well with makeup brushes too. 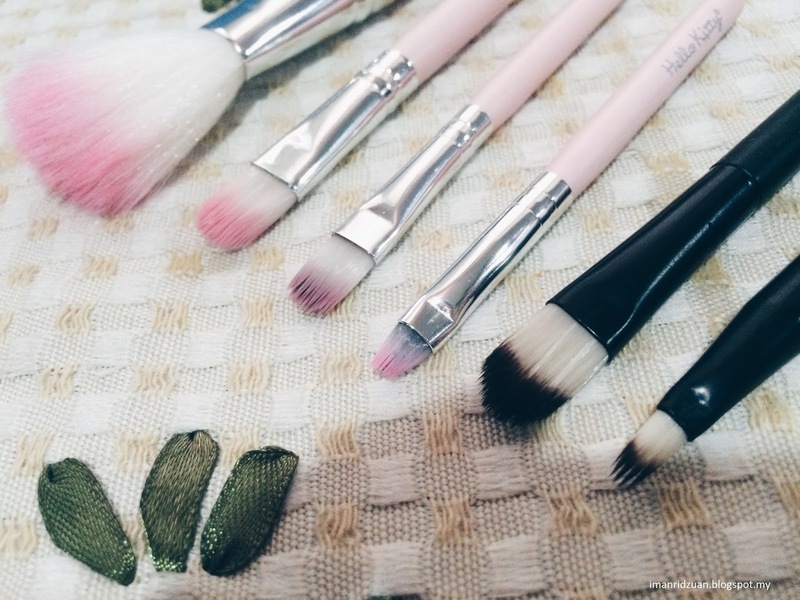 But I wouldn't really recommend using it for high quality brushes as the detergent is quite drying, it may affect the quality of the bristles of your lovely brushes. As you can see from the pictures above, it does a pretty good job at cleaning most of the makeup products off my brushes, but there are some brushes that still aren't completely clean, even after several rinses with the detergent and water. So I would still opt for baby shampoo for my makeup brushes. For RM5.30, (Including gst) I think this is a great product. The only downside is like I said, it is a little drying. I mean, it is a detergent after all. So you wanna make sure that you use a glove or just lather a good moisturizer to your hands afterwards. Thank you for reading!